Our Products >> Lewbari Rope Tote 36" x 42"
This rope tote is the latest, greatest thing. It carries your rope comfortably and is easy to use. Just tie square knots at the corners and fold it like a larkshead. The pictures above show how. Zipper pocket has room enough for a ring and safety tools. 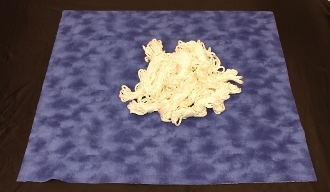 Also unties as a small blanket for your bottom lay on. Lewbari Rope Tote 36" x 42"